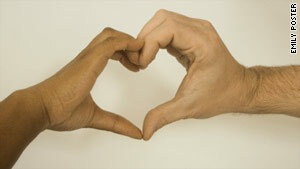 Love can conquer even racist parents, says columnist. (The Frisky) -- "My parents are racist," my Filipino boyfriend Edward said, sounding defeated. My heart made a sudden jolt and then quieted down in my chest. I knew there was something off about this man. Our six-month relationship had been bliss --he was funny, whip smart, and, well, perfect. His quips matched mine and what he lacked in social skills he made up for with his love of conspiracy theories and the ability to play eight instruments. He wrote me two songs and told me that when he looked at me, he heard music. I should have guessed that all his wonderful traits were overcompensating to make up for his family. "But, I'm Catholic," I blurted out. "And I'm cute and funny." I could feel tears brimming as I looked away. As a 25-year-old African American woman living in the age of Obama, I couldn't believe what I was hearing. I looked at him, my expression clearly conveying dismay and confusion. "Trust me; I've tried to talk to them. But they are stuck in their ways. They grew up in another time," he said. "It was different when they came here from the Philippines 30 years ago. " A California native and newcomer to New York City, I had never personally met any civilized people who were openly racist. When I thought of hate-spouting rhetoric, my mind instantly conjured up images of inbred monsters with a love of banjos and moonshine in Kansas during the 1940s -- not an elderly Filipino couple in New Jersey in 2009. I could think of reasons why a significant other's parents wouldn't like me, but color was never one of them. Yes, I blurted out random thoughts whenever I pleased, mostly of the unsolicited advice variety. I could be argumentative and was always positive I was right. I bit my nails. I left toothpaste smeared in the sink. But how could anyone dislike me not knowing these little things? I glanced over to see Ed staring at me with apologetic eyes. What started out as a lovely morning in my sunlit Queens bedroom was turning into a nightmare from a made-for-TV movie. "Well how bad are they?" I asked, trying to sound optimistic. "I mean there's the KKK and then there is Archie Bunker." "It's pretty bad," he said. "They think dating someone black is downgrading. They say I shouldn't date anyone darker than a paper bag. They would prefer me to date someone either my own race or a white girl. I've tried to explain to them that interracial children are genetically superior to single-race kids." He gave me a sheepish grin. The Frisky: Why is my skin color such a novelty to men? I pictured Ed going on a Darwinian rant to his religious folks. I struggled with what to say next, contemplating my skin's proximity to an item used to hold groceries. Cruel words formed in my mouth as I held back the urge to yell. My family is pretty much like the Obamas. My dad has a master's degree and a good government job. My Creole mother is a registered nurse for a plastic surgeon. My younger brother is studying to be a doctor. My mom and dad were constantly kissing and hugging each other, and I only heard my mom and dad argue once. I talked to my mom almost every day and my dad sent me a text at least twice a week to say he loved me and was proud of me. I realized I was the lucky one. I had come from an accepting brood that would never pass judgment on anyone. I glanced at Ed and felt suddenly sorry for him. "You have to tell them about me," I said "You can't lie. If you're that embarrassed then we have to break up. I can't be a secret." Ed pulled me closer and held me. But I wasn't so sure he would ever tell his parents about me. The Frisky: How long does it take to get over an ex? A month later, he and his family went on a matchmaking get-away disguised as a church retreat. Upon arrival, he was introduced to every eligible purebred girl in the parish. When he returned from his holy adventure, he revealed that he had finally told his parents about me. "Every time I turned around, I was being introduced to a nice Filipino girl," he said. "So I decided to tell them. They were dismissive, but they got the point." And all of a sudden, I realized that what his parents thought didn't matter at all. I reached out and grabbed his hand. Our skin melted, and you couldn't tell where his stopped and mine started.